American nuclear orbital launch vehicle. 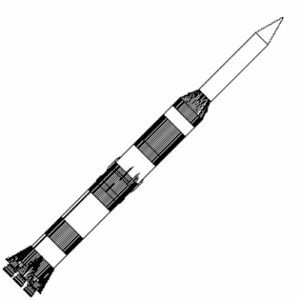 Version of Saturn C-5 considered with small nuclear thermal stage in place of S-IVB oxygen/hydrogen stage. Status: Study 1961. Payload: 155,000 kg (341,000 lb). Thrust: 33,350.00 kN (7,497,370 lbf). Gross mass: 2,841,040 kg (6,263,420 lb). Height: 100.00 m (320.00 ft). Diameter: 10.06 m (33.00 ft). Apogee: 185 km (114 mi). LEO Payload: 155,000 kg (341,000 lb) to a 185 km orbit at 28.00 degrees. Payload: 64,000 kg (141,000 lb) to a translunar trajectory. Stage 1. 1 x Saturn IC C-5A. Gross Mass: 2,217,285 kg (4,888,276 lb). Empty Mass: 131,495 kg (289,896 lb). Thrust (vac): 38,257.990 kN (8,600,738 lbf). Isp: 304 sec. Burn time: 160 sec. Isp(sl): 265 sec. Diameter: 10.06 m (33.00 ft). Span: 19.00 m (62.00 ft). Length: 42.87 m (140.64 ft). Propellants: Lox/Kerosene. No Engines: 5. Engine: F-1. Status: Study 1961. 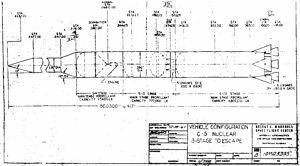 Comments: Final first stage design of Saturn C-5 (November 1961) before selection as Apollo launch vehicle and development in Saturn V.
Stage 2. 1 x Saturn II C-5A. Gross Mass: 384,057 kg (846,700 lb). Empty Mass: 31,740 kg (69,970 lb). Thrust (vac): 4,446.648 kN (999,646 lbf). Isp: 420 sec. Burn time: 320 sec. Isp(sl): 200 sec. Diameter: 10.06 m (33.00 ft). Span: 10.06 m (33.00 ft). Length: 21.39 m (70.17 ft). Propellants: Lox/LH2. No Engines: 5. Engine: J-2. Status: Study 1961. Comments: Final common second stage design for Saturn C-3, C-4 and C-5 (November 1961). Developed into Saturn V second stage. Stage 3. 1 x Saturn S-N C-5N. Gross Mass: 53,694 kg (118,375 lb). Empty Mass: 10,429 kg (22,992 lb). Thrust (vac): 266.799 kN (59,979 lbf). Isp: 800 sec. Burn time: 1,250 sec. Diameter: 10.06 m (33.00 ft). Span: 10.06 m (33.00 ft). Length: 19.30 m (63.30 ft). Propellants: Nuclear/LH2. No Engines: 1. Engine: Nerva. Status: Study 1961. Comments: Nuclear upper stage considered in lieu of S-IVB in final Saturn C-5 study in November 1961. Family: nuclear-powered, orbital launch vehicle. People: von Braun. Country: USA. Engines: Nerva-1, F-1, J-2. 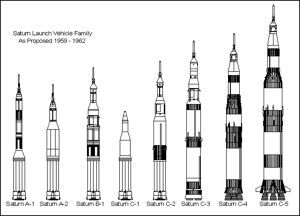 Stages: Saturn IC C-5A, Saturn II C-5A, Saturn S-N C-5N.